The carved and painted shields on the pew ends in St Swithun’s church are an unusual, colourful and interesting decoration. 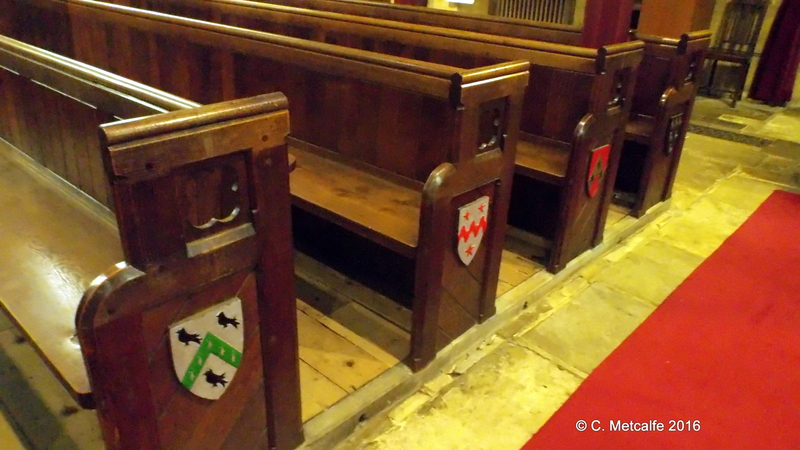 The 1946 Guide to St Swithun’s says simply: ‘Shields of old-time Sussex families, carved by East Grinstead Boy Scouts, are fixed to the pew ends.‘ The 1975 Guide adds that the shields were the work of Boy Scouts in the 1930s under Dr Spencer Lewis Walker. Dr Spencer Lewis Walker was a local GP, who died in 1967, aged 86. He came to live in East Grinstead in 1910 to work as a medical practitioner. He became Scoutmaster to the newly formed Boy Scouts and continued to be a dynamic leader until 1947. His obituary in the East Grinstead Observer, on 27 April 1967 refers to his love of history, interest in heraldry, extensive knowledge of noble and gentry families and how he enjoyed sketching coats of arms. He must have guided and inspired the Scouts to create the wooden shields for the church. 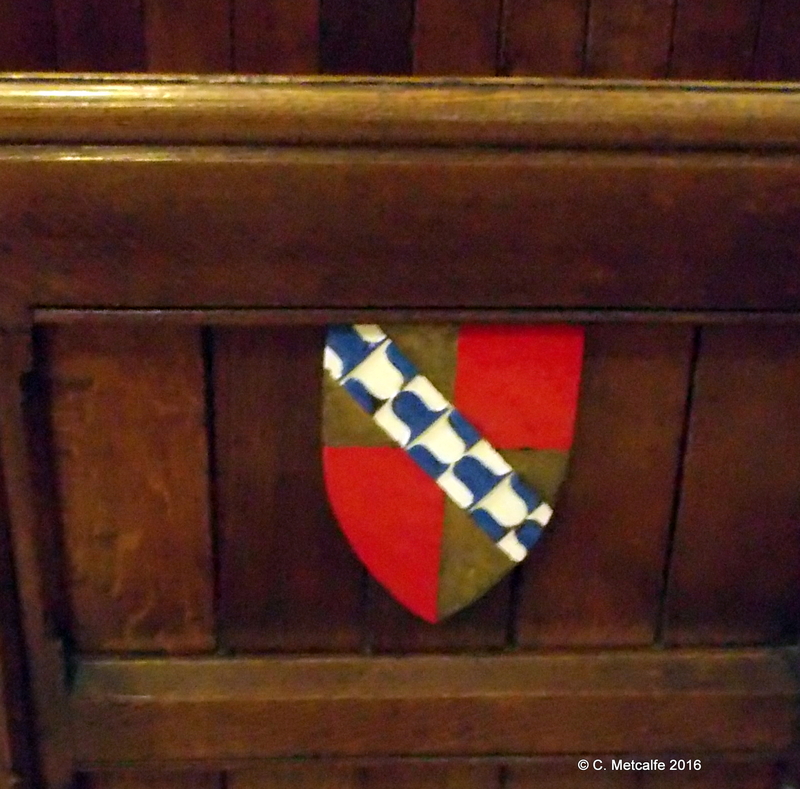 The shields are carved from oak, and may not have been coloured originally. No definitive list giving the names of the families represented seems to have survived. Since then, more shields have been added and at some stage they were painted in bright colours. There are strict rules for Heraldry, which include using one of 2 ‘metals’, Or and Argent- gold and silver, and colours chosen from: Gules (red), Azure (blue), Vert (green), purpure (purple-ish), Sable (black). A colour may not be placed on another colour, nor a metal on another metal. This is so that shields can be distinguished from a distance. This idea takes us back to the origins of heraldry: it was used for recognition, particularly in battle. Certain furs could be depicted: Ermine from the Arctic Stoat, and Vair from Squirrel. 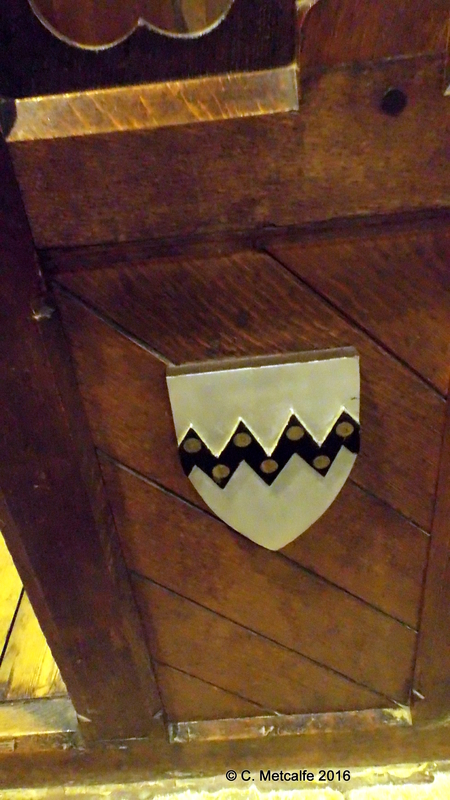 The Sackville shield includes a diagonal strip of blue and white, which looks like bells, but represents the fur ‘Vair’. A complete achievement or coat of arms usually includes: the shield, a crest, mantling, a motto, and supporters upholding the shield. The Royal coat of arms has a lion as a supporter. The Sackville coat of arms has the snow leopard or ounce. When a man who had the right to display a coat of arms married, his coat of arms would be ‘impaled’ with those of his wife, the man’s coat of arms on the dexter or right hand side, the lady’s on the sinister or left. Just to confuse things, dexter and sinister, refer to the point of view of the person holding the shield, not the onlooker. In the 1990s, a leaflet was produced at St Swithun’s, in memory of one parishioner, acknowledging the help of two present parishioners of St Swithun’s in carrying out research and repairs to the shields. A laminated copy of this leaflet is available to read in the church.